It was a historic day at the Sharjah Stadium this last Friday as Pakistan took on Afghanistan in the first ever ODI between the two teams. For Afghanistan it was a day to show the world what they were capable of against a top ODI nation, and one that has been instrumental in supporting their rise amongst the cricket nations. From the time of Afghan refugees learning the game in Pakistan in the late 70s to now when Afghanistan participates in Pakistan's domestic competitions, Pakistan has been instrumental in helping cricket flourish in the troubled country. For Pakistan, it was at best a practice match; however the fans, especially the pakhtoons, were left confused about who to support. For them, Afghanistan is their country, but they have been affiliated to Pakistan for so long that for some even that is home. But that was not the factor causing the confusion amongst the Pakhtoons. It was Shahid Afridi! As one poster in the ground said "We love Afghanistan. Shahid Afridi lives in our hearts". A pakhtoon himself, Shahid Afridi has a crazy fan following amongst the pakhtoons. Ironically enough, it was Shahid Afridi who stamped his authority on the Afghanistan batsmen with figures of 5-36. Those figures took Afridi to a tally of 338 wickets in ODIs taking him ahead of Anil Kumble's 337 ODI wickets and placing him at number 8 on the list of highest ODI wicket takers in the history of the game. 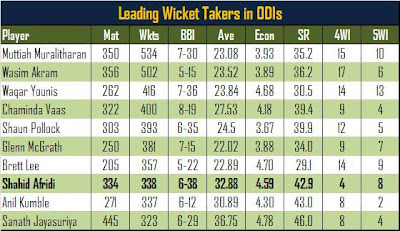 This also means that Afridi is the highest ODI wicket taker amongst leg spinners, and the second highest amongst all spinners. That is quite an achievement, especially for someone who was mistakenly considered a batsman for a large part of his career. There is no doubt that Afridi is one of the best, if not the best, ODI bowlers in the world at present. Yet even today there are fans out there who demand centuries from his bat, for reasons I will never understand. Afridi's performance with the ball in hand has been exceptional for the last five years or so. Imagine what he would have managed with the ball had he not scored the fastest ODI century 16 years ago and had the Pakistani management not wasted so much time in trying to turn him into a proper batsman. Imagine where Afridi would have been on the list shown above had he always concentrated on his bowling the way he has done in the last five years. Because in the last five years there is only one bowler who has more ODI wickets than Afridi does. 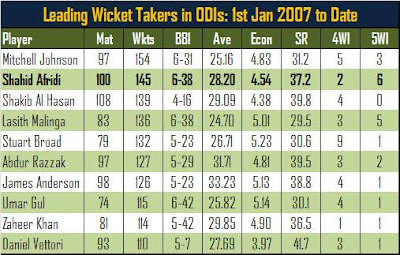 Since January 2007, Afridi has picked up the second most number of wickets in ODIs, has the most number of 5 wicket hauls, and has the third best economy rate. And yet people still want to see him whack sixes? I would any day prefer to see Afridi run up from his bowling mark, turn the ball enough to beat the batsman and hit the stumps, and then stand in his customary pose celebrating one more wicket. Talking about possibilities: if he had not scored that fastest century, it's possible that he wouldn't be playing cricket for Pakistan today. He certainly wasn't half as good a bowler back then as he is today. So had he not caught everyone's imagination through that one innings, he might have been long forgotten. Interesting stuff. I hope his batting will return with some aged circumspection...but not holding my breath. I have a theory he gets late dip on the ball despite not many revs, but people generally think this is nonsense. Darn people.